This spring, lawmakers made significant progress on a bipartisan school funding bill through good faith negotiations. Though close on a bipartisan compromise, the House Majority party chose to walk away from the negotiating table in late May and pass a partisan school funding bill, Senate Bill 1. “I could not support this proposal, which once again singled out one school district, Chicago Public School District 299, to receive hundreds of millions of dollars in special deals. In fact, under Senate Bill 1 seven out of every ten new dollars dedicated to school funding would be directed to Chicago,” said Rep. Dan Swanson. 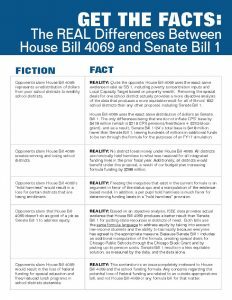 “Additionally, Senate Bill 1 was not adequately funded in the budget passed by Senate Democrats in late May, and without the necessary funding would once again lead to the proration that plagued Illinois schools for years. In fact, the Democrats have not advanced a budget bill that provides the appropriate funding level required to satisfy the simulation they are promoting with Senate Bill 1,” Swanson continued. For these reasons, the Governor has promised to veto the plan. This means the fate of Senate Bill 1 is clear. However, there is an alternative that reflects a compromise worthy of bipartisan support. One in which all school districts would benefit under the more equitable formula advanced under House Bill 4069. In the spirit of compromise, the proposal adopts the overwhelming majority of Senate Bill 1. In fact, there are far more similarities between the two bills than there are differences. 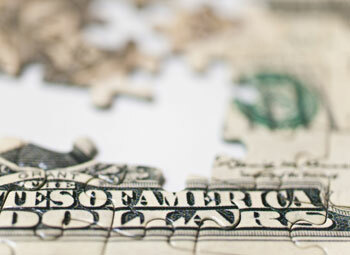 Both bills utilize the same evidence-based model, as well as the same methods to deliver funding to low-income students, along with identical systems to determine cost differences between districts. In addition, both measures group districts into the same four tiers based on need and use the same local resource calculations. Further, both proposals feature the same safeguards for English learners and special education funds. In May, the sponsor of Senate Bill 1, Senator Andy Manar, stated that the two proposals were 95 percent the same. Now, according to the sponsor of House Bill 4069, Representative Bob Pritchard, they are nearly identical, with a few important differences. House Bill 4069 recognizes that Chicago needs help, and it provides the school district with assistance, based on evidence-based practices and the demographics of their students. What it doesn’t offer are special deals hidden in the formula that are designed to fix the Chicago Public Schools’ broken pension system and pay off their overwhelming debt from years of fiscal mismanagement. Instead, House Bill 4069 relies on the data, and the data alone, to drive resources to the schools that need it most, including Chicago. “CPS has not run a school referendum in over 60 years. By comparison, AlWood (in the 74th District) conducted, 5 referendums in approximately 14 years,” said Rep. Swanson. “Downstate taxpayers have tried to fund and improve their schools adequately, but not such effort has been made by Chicago taxpayers. This is not about pitting the City of Chicago versus downstate, but we must not ignore the history of referendum driven efforts as well as the disparity in the way property taxes are assessed in Cook County,” Swanson continued. Swanson, rightly, points out that even property tax assessments are lower on Chicago homeowners, allowing the City of Chicago to charge high-rise owners more while providing their own property tax relief on single-family homeowners. House Bill 4069 is good for all of our state’s 852 different school districts. Unlike Senate Bill 1, the legislation does not single out one district to pit students from different regions against each other. Instead, all schools are all treated the same under a formula that is the same for everyone regardless of their zip code. In fact, recently released data from the Illinois State Board of Education shows that House Bill 4069 in its current form is unquestionably more equitable for all low-income students in Illinois. Below is a chart demonstrating how House 74th District Schools benefit from House Bill 4069. The General Assembly has returned to Springfield and is scheduled to work through the end of June. There is nothing standing in our way of immediately acting on House Bill 4069. The Governor has stated that he would sign this legislation into law if it passes the General Assembly. We can fix our broken and outdated formula before the end of the fiscal year with a plan that is fair for all Illinois schools.You can view the results of the ISBE analysis for Senate Bill 1124 SFA 3/House Bill 4069 at https://www.isbe.net/Pages/Education-Funding-Proposals.aspx. 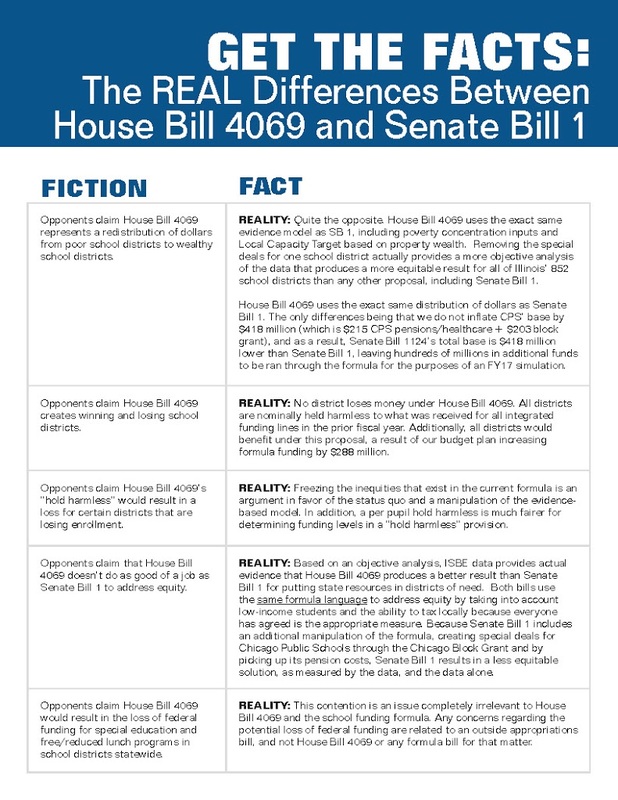 Below is an additional chart dispelling some of the misinformation being put out on HB 4069.